Obedient dog + dramatic background music = FUNNY CUTENESS EXPLOSION! Patience. No matter how tempting one opportunity may get, you must wait until you feel that it is the right time... or maybeeee just 'cos your OWNER says so. Haha! I stumbled upon this really cute video on Youtube, and this is a cute and funny one, because of the dramatic music background that seems to sympathize with the adorable dog. 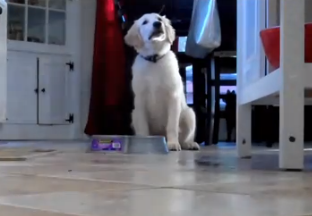 I won't spoil the video to you guys, but I'm sure you know how an obedience food test goes. However, the twist here is how the video owner combined all the elements into making a really watch-worthy video. Awww... very obedient puppy nga. hihi..
Teddybear is like that.. very respectful and obedient. Pokeybear is hopeless. LOL.. My dogs. I love them both.